We provide worldwide testing services in the fields of acoustics and vibration. We developed specialized computer programs, specialized testing and analysis methodologies for the benefit of our clients. Testing is conducted in accordance with industry standards. Our goal is to fulfill client requirements in a timely and cost-effective manner. Testing and analysis methodologies are clearly stated in our reports. The following is a small sample of the testing projects we have performed within the past few years. A high tech facility experienced a sudden degradation in the performance of their laser cameras due to a vibration problem of unknown cause. 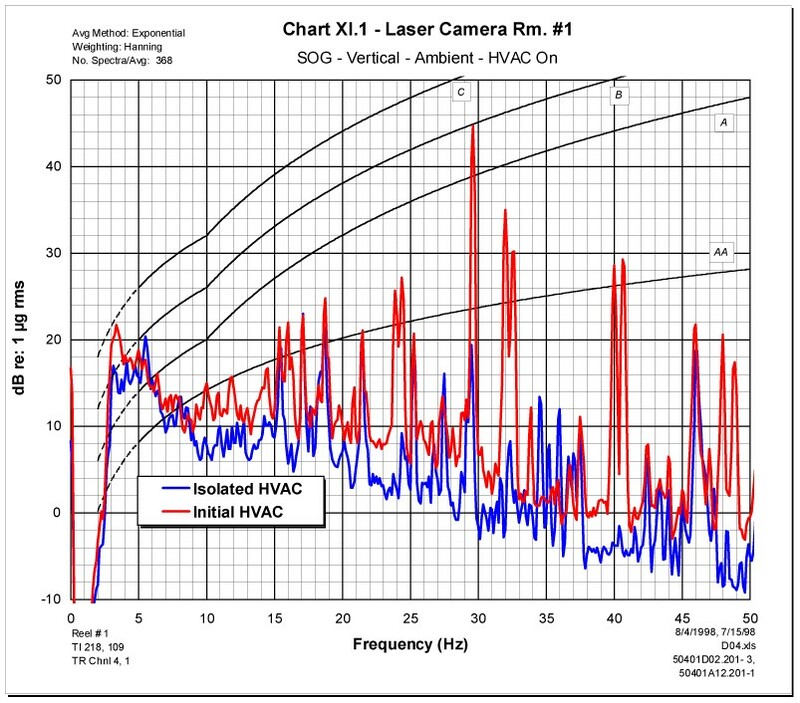 Results of noise and vibration measurements conducted by FHA reviewed a 29.5 Hz vibration peak due to the HVAC system. Proper isolation of the HVAC system was recommended. The facility reported no further problems with the laser cameras due to the operation of the HVAC system upon implementation of FHA's recommendations. Employees in an office building complained about perceptible vibration on their desks. Vibration testing was conducted by FHA at the site to evaluate vibration relative to building occupants, using the ANSI Threshold of Perception. 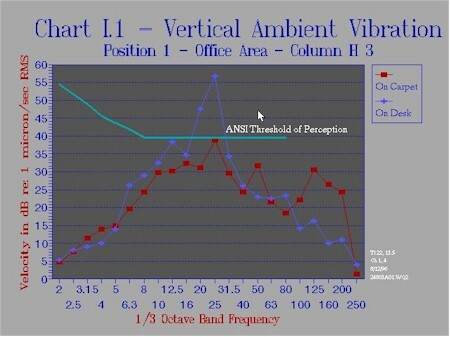 Vibration levels measured on the desks at selected locations exceeded the ANSI Threshold by about 18 dB re: 1 µm/s RMS. On-site observation also reviewed that excessively stiff spring hangers were installed in two of the suspended transfer fans. The situation was worsened by the use of springs for lateral seismic restraints. FHA recommended replacing the as-built lateral seismic restraints (springs) with slack aircraft cables, installing thrust restraints at flexible duct connections to adjacent ductwork, and in-field inspection of the spring hangers. Some of the spring hangers were found to be short-circuited upon further inspection. FHA's recommendations were implemented and subsequent on-site testing showed vibration levels on the desks of previously tested locations to be at the nominal ANSI Threshold. No further complaints were reported.